our dentists. You should not act on any of the information contained therein without first seeking your own dental advice. 1. Find the tooth. Hold the tooth by the crown (the white part), not by the root (the yellow part). 2. Replant immediately, if possible. 3. If contaminated, rinse shortly with cold tap water and put the tooth back in its place. This can be done by the child or an adult. 4. Hold the tooth in place. Bite on a handkerchief to hold it in position and go to the dentist immediately. 5. 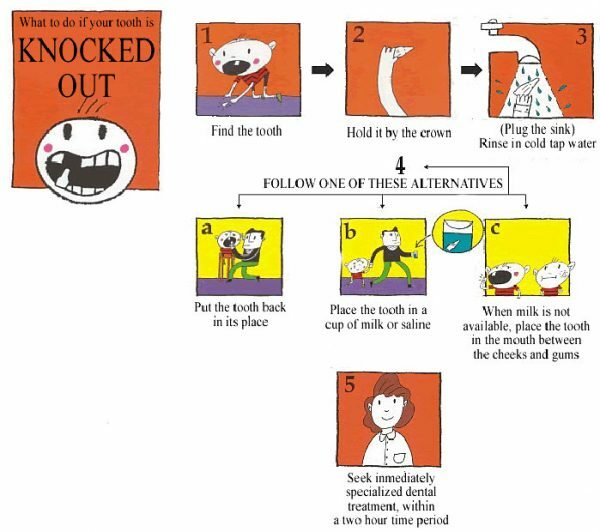 If you can not put the tooth back in, place it in a cup of milk or saline. When milk or saline is not available, place the tooth in the child’s mouth (between the cheeks and gums). 6. Seek immediately specialised dental treatment. • Children between 7 and 10 years of age are more exposed to suffer avulsion due to the elasticity of the bone at this age. • Good oral hygiene is absolutely necessary in the healing period.